First, you need to think about which apps you use multiple times a day. Those are the apps that belong on your Home or first iPhone screen. It’s simple to drag and drop them to that first page. Put your index finger on the icon for that app and hold it there. Don’t tap it! After about 3 to 5 seconds, it will start to “wiggle”. Then you can move the app by dragging it. If it’s not already on the first page, drag it towards the left until the previous page appears. Continue doing that until you are on the first page of your phone. Then you can drop it onto that page. Next, you might have noticed that some of your apps are related. For example I have several apps I check for the weather, several for News, and several for sending messages. 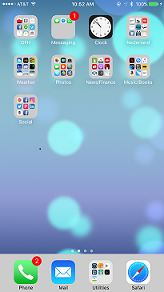 I have grouped those apps together so that they are all in one place. Again, hold the icon for one of those apps until it starts to “wiggle”. Then drag it on top of the app you want to group it with. Your iPhone will give the grouping a name. You can change that name by clicking the small “x” next to the title, and typing in your own name for that group. Lastly, once you have all of your apps in different groups, it is easier to “drag and drop” them to the Home page or a second page. I try to keep all of my apps on just two pages. The first or Home iPhone screen is where I have the apps I use the most. The second page has the apps I don’t use every day or even once a week. If you found this helpful, please forward it to your fellow iPhone users! 4G Service – What the heck is that? What the heck does this mean? And sometimes when I complain to Chris about my lousy cell quality he’ll ask me what kind of service I have. Invariably the answer is “3G”. What the heck is that?! Basically, my phone is currently providing me with 4G service so that I can surf the internet and send videos to my friends with wild abandon! The 5G technology is still being defined, but you can expect to see it in the next year or two. In the meantime AT&T and Verizon are launching pre-5G which will increase speeds and decrease latency. Geek For Hire gets calls just about every day from someone who is concerned about an email they’ve received, or a phone call, or a popup warning. Usually I’m able to tell them that all is well. How do I know that? There are a few key things to make sure your machine stays safe from malware. Have you received a phone call from someone claiming to be Dell Technical Support – or HP, or any of the other manufacturers? If you have not initiated that call, it is most likely a scam. They will be very convincing, telling you that you need to install updates, or that you have a virus. Hang up! As long as you don’t give them access to your machine, you should be fine. Have you received a phone call from someone claiming to be Microsoft? They generally tell you that your Operating System is not up to date and they need to get access to your computer to download the appropriate files. Again, these folks are very convincing, but you should hang up. Have you received an email from a technical company offering to review your machine for viruses and other problems? Send that email to your spam folder and ignore it! Make sure you don’t click on any of the links in the email. 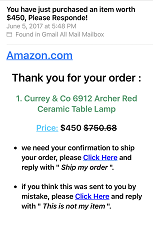 Have you received an email from “Amazon” claiming that you have just purchased an item for $457? They just need you to click on this one link to confirm your purchase. Don’t click on it! Delete the email! It is a scam! Have you seen a pop-up on your machine saying that your machine is badly infected and you need to click on a link to get it resolved? In many cases you may already have some kind of malware installed on your computer. Once you click on the link, you’ve “given permission” for additional malware to be downloaded and installed on your machine. In this case you should run your virus scanner to see if it can remove the malware. If it can’t remove it, or if it says it’s not finding any, you should call for professional help. Whenever you suspect an issue with your machine, run your virus scanner to make sure your machine is safe from malware. If you found these tips helpful, please forward it to your friends! I’ve had an iPhone for a long time and love the convenience of having a mini-computer at the ready. I remember how thrilled I was when I found a way to access websites I went to all the time with just one touch. Adding an icon to your iPhone is the key. I know from personal experience that having a Smartphone that is efficient can really make life easier. And it is not as hard to set up as you might think. One thing that can help you a lot is to create an icon so that favorite websites are only one click away. When you add a new app to your Smartphone, it will automatically add the new icon to your iPhone screen. But there are some places you go to on the internet that haven’t created an app yet. If you’d like to get there quickly, it’s easy to add that website as an icon to your iPhone screen. The first thing you need to do, is to enter the url (the web address) into Safari (or whichever browser you are using). Once the page loads completely, swipe the page down with your finger until the navigation menu appears on the bottom. Click the center icon – it looks like a box with an arrow pointing up. Then, slide the bottom row of icons to the left and click on the icon which says “Add to Home Screen”. Only about 10 characters will show on your screen to indicate the website. I’d advise editing the title so that it is under 10 characters. Keep your eyes peeled for more hints on optimizing your iPhone! Never have I been so happy that I already have a virtual office set up as I have been for the past few months. Last year I traveled several times to the East Coast while my kids hiked the Appalachian Trail. 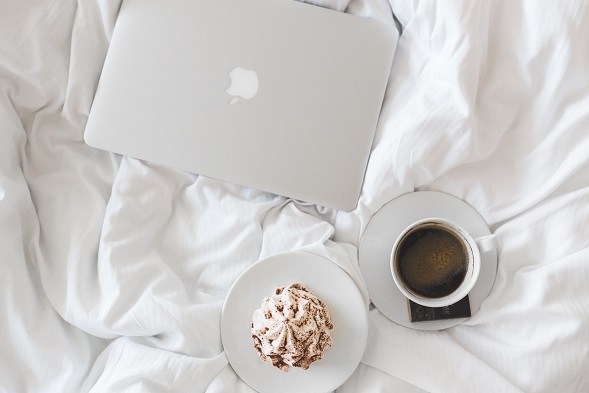 Because of my virtual office set up, I was able to manage our business wherever I was. Recently though, I’ve had a much greater need for a virtual setup. In the past three months, I’ve had two surgeries. A total knee replacement in February, and my other knee in April. When you can’t get around, and spend most of your time resting and healing, it’s good to have tried and true technology at your bedside. You must have fast WiFi. A minimum of 12mbps is recommended. Remember that you may have to upgrade your router in order to provide the actual speed that is being flowed from your ISP to your devices. Good routers have low latency and can support many simultaneous users. Cheap routers tend to support only one user at a time. Chris recommends this Linksys router. Sometimes a laptop is just too heavy! My iPad has been perfect for internet research, sending email, and keeping the Geek For Hire calendar up-to-date. And it’s great for watching AmazonPrime movies and keeping up with Facebook. Well, that kind of goes without saying! Make sure you are able to easily reach your charging cords. You may need to add a power strip right next to your bed to easily charge your phone and other equipment. Sure, you can get a lot of business accomplished with just your Smartphone and tablet. But sometimes, you just need your laptop to do certain tasks. For example, Quickbooks won’t let me enter all the detail I’d like on their mobile app. I need to login to Quickbooks from my laptop to do that. Entertainment value. Pure and simple. Sometimes when you’re stuck in bed, it’s hard to sleep when other people are sleeping and you don’t want to disturb them in the middle of the night. Having a good pair of headphones keeps the volume down when you’re watching Speed at 3am. Here’s my recent blog about Bluetooth headphones. Typing on a tablet can be cumbersome. The hands – so big. The keyboard – so small. The mistakes – so many! Get yourself a Bluetooth keyboard and typing will be much easier. The newer ones have back-lighting which makes it easier to type when the lights are dimmed. Sometimes you just can’t type. (Two of my friends have recently had shoulder surgery.) Many of our customers have used Dragon Naturally Speaking to get their thought down without typing. Keep in mind that it does take a bit to customize the software to your voice. Remember, it’s better to plan ahead and get your virtual office technology in line before you need it!